Know North Salinas HS Class of 1971 graduates that are NOT on this List? Help us Update the 1971 Class List by adding missing names. It's time to celebrate 45 years since we graduated from high school. The event is to be held over this year's Veterans Holiday weekend and it's coming up soon. Sun 11/13 Sorry, Tour of NSHS and Meetup has been cancelled. Please, send an email to *****@yahoo.com to let us know your current whereabouts and your interest in attending the event(s). You can send payment and your whereabouts to NSHS Reunion, c/o 140 John St, Salinas, Ca 93901. Make checks payable to NSHS Class of 71. Payment due date has been extended to Oct 31. You can pay later or at the door, for an additional $10. It's been 15 years since the last reunion, so needless to say our contact list is sorely out-of-date. We would really appreciate any current contact information you might have for your fellow classmates. Email would be especially nice. This should be fun. Pass the word along. Hope to see there! I am putting together a slide show for the Saturday night event at the Elk's Lodge and as part of that show I want to honor any and all classmates whom have served in any branch of the military, or in any capacity to protect and serve their community, for example as a police officer, sheriff, national Guard, firefighter, etc. So if you have served in this capacity no matter how long, or know of one of our classmates that have done so please get back to me. I would appreciate the name and the branch of service or capacity in which you served. You can contact me here, or directly at *****@gmail.com or feel free to call me personally at (831) 760-XXXX . Thanks and I am looking forward to seeing you at our reunion. OK all you NSHS Class of 1971 Alumni, this is a rough and crude sample of a slide show I am creating for our 45th Reunion this coming Veterans Weekend, November 11th - 13th. The actual slide show will have pictures of every classmate from their freshman and senior years. Additionally their will be 2 other separate themed components of the show. Slideshow note: As a sample for your viewing pleasure I have included, hopefully all the members of our 45th Reunion Committee Organizers. CONTEST : The first NSHS Class of 71 Graduate to correctly identify each person in slide show as well as what class they were in when their picture was taken, ie Fr/Soph/Jr/or Senior will have a prize waiting for you at the Elks Lodge, Saturday, November 12th. Reunion Committee Members and their family are not eligible to participate. (831) 760-XXXX . It's going to be a fun get together with a number of our classmates coming whom have never been to a previous reunion, plus Hannelore Blumel, the foreign exchange student from Germany during our senior year, is flying in from Germany to attend. We are trying to get in touch with as many NSHS Class of 71 alumni as possible, but can only do this with your help. Thanks to all of you whom have responded plus have put us in touch with other former classmates. See you there! Soon the outcome of one of the most unconventional, unpredictable and enigmatic presidential campaigns in American History will finally be known. 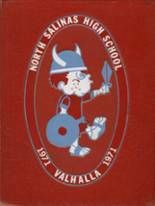 Three days following that outcome, literally on the heels of the election, another historic and monumental event will occur - North Salinas High School Class of 1971, 45th Reunion, November 11-12, 2016. Unlike the presidential campaign, there will be no disparity of any kind at our reunion; you will not be repeatedly asked to dig deep into your pockets for monetary contributions; our differences will be celebrated; and at our reunion EVERYONE IS A WINNER! This is critical for a number of reasons. For those planning on coming there is important information you need regarding the Weekend; plus we need you to send some information back to us as per instructions on the invitation. We STILL need your current contact information even if you have replied "yes", "no" or "undecided" on a social media website, i.e. Facebook, Classmates, and NSHS Class of 1971 website. Those websites are unable to facilitate the exchange of information needed critical not only to this reunion, but to future reunions; for example, our 50th in 2021...I can't believe I am writing our "50th Reunion in 2021"...how time flies by! Our goal in sending invitation to everyone is not only that you have it as a souvenir, but it is an important tool to solicit your help in locating missing classmates, as well as gathering necessary information for slideshow presentations we are preparing for the Saturday night, November 12th extravaganza. 3) Following the reunion we are planning on making available copies of the slide show presentations and pictures from the weekend's festivities, via a CD. This way, those that could not be there can still share some of the memories; which is another reason for your current contact information. Please also note that for various reasons the tour of NSHS on Sunday, along with hanging out afterwards, unfortunately had to be cancelled. We anticipate that there will be impromptu, spontaneous gatherings at various places in town on Sunday. We will keep you posted of them in the days prior, most likely Friday and Saturday night. Ultimately, the reunion committee's goal is to get in touch with, and gather as many former classmates together as possible, so that we can share old memories and make new ones - AND as one classmate commented, "Let's get together before we all have to bring our walkers or wheelchairs"....ha ha ha! Thanks for reading and looking forward to seeing you soon, your former ASB President, Frank Tavani. Contact us via email at nshsclass of71 @ *****.com (remove spaces), mail to NSHS Reunion c/o 140 John St in Salinas, CA 93901, or call Frank at (831) 760-XXXX The deadline for payment is coming up fast; however, we have extended it to October 31. Please send in your money ASAP, we are having to address payments ahead of the event to assure it happens. Send me or Shawn Laughingtree (aka Frank Tavani) a message if you would like more information. More 1971 alumni from North Salinas HS have posted profiles on Classmates.com®. Click here to register for free at Classmates.com® and view other 1971 alumni. Missing some friends from North Salinas High that graduated with you in 1971? Check the list below that shows the North Salinas class of '71. You can also find out what other graduates are doing now, share memories with other alumn, upload pictures from North Salinas High and find other alumni.